We usually present you with new motherboards for Intel processors, and sometimes for AMD’s APUs, something that is logic considering that for the AM3+ socket there has barely been any new launches for some time now. 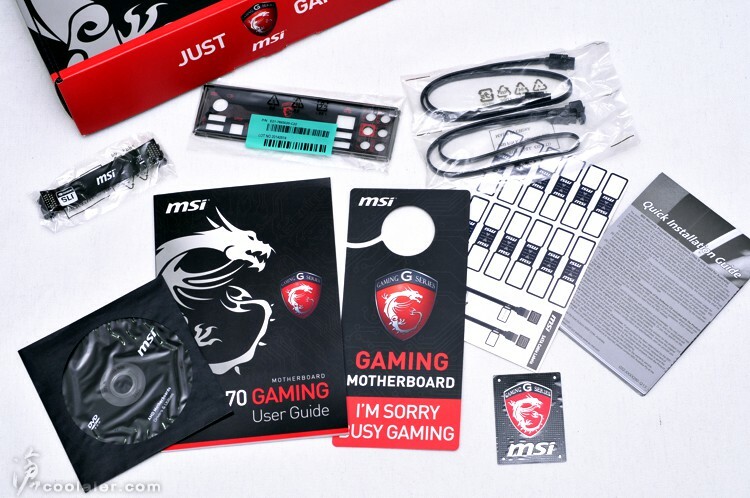 However, MSI has just given a step forward by updating one of their most demanded models to reflect the Gaming design. The MSI 970 Gaming is an exceptional model for those who want to fully benefit from AMD FX Series processors along with their multiple extra features. It is worth mentioning that in the specs, there is no reference to compatibility with NVIDIA’s SLI, and, even more so, the chipset itself doesn’t allow it. Why then is there an SLI bridge? Funny detail. Once we have the MSI 970 Gaming in our hands, we find ourselves before an ATX motherboard (30.5 x 24.4 cm) with a design that mixes the black of the PBC with red details, mark of the MSI Gaming family. In the upper zone we can find the AM3+ socket for AMD FX, Phenom II, Athlon II or Sempron processors. To its left, the power source phases for the VRM have a wide dissipater, next to it, the usual ATV/EPS 8 pin connector is situated, while under it there is the AMD 970 chipset. To the right of the socket we find the 4 slots for DDR3 memories compatible with modules of up to 1866MHz by default, although under overclock we can reach the 2133 MHz according to the specs. As it is now general rule, they use a dual-channel architecture, although they are not compatible with XMP memory profiles. We can highlight that the AM3+ socket is compatible with AM3 processors, but not so with AM2/AM2+. On the lower zone we find 2 PCIe x16 3.0 slots that allow for CrossFire 2-way configuration, but not SLI, in x16/x8x8 configurations. 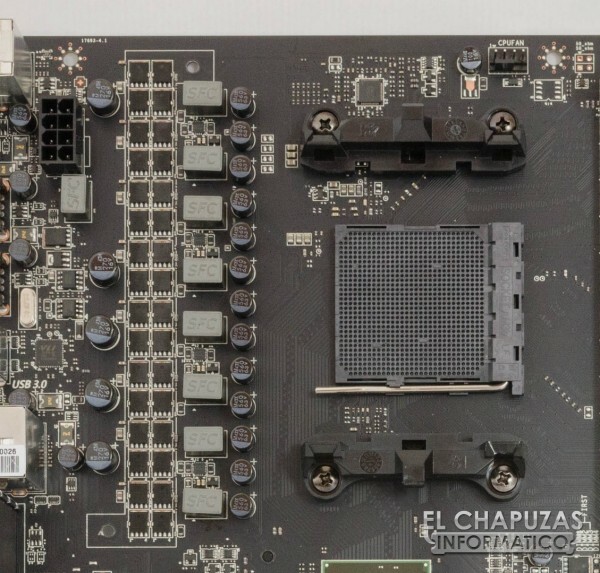 We have also 2 PCIe 2.0 x1 slots and 2 PCI slots, which is logic if we take into account that the chipset allows it, although we should be getting rid of them in favor of new connectivity technologies like the M.2. On the upper margin we only find a connector for a chassis fan (SYSFAN1), a connector for the processor’s fan (CPUFAN1) and the ATX 8 pin connector mentioned before. 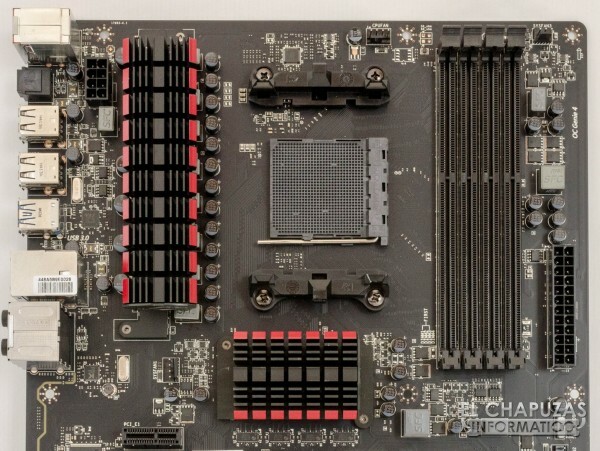 A big difference from Intel motherboards is the absence of video connectors, as AMD AM3/AM3+ processors do not integrate graphs. On the lower left corner we find another strong point of the MSI 970 Gaming, the integrated audio card based on the REALTEK ALC1150 7.1 chip which has an electromagnetic barrier (EMI), has the MSI Audio Boot 2 technology which offers sound with better quality thanks to some features like a double amplifier, Nippon Chemi-con filtering condensers (reduce electric noise and diminish interferences), gold plated connectors, headphones amplifiers up to 600 ohms and a separated PBC section. 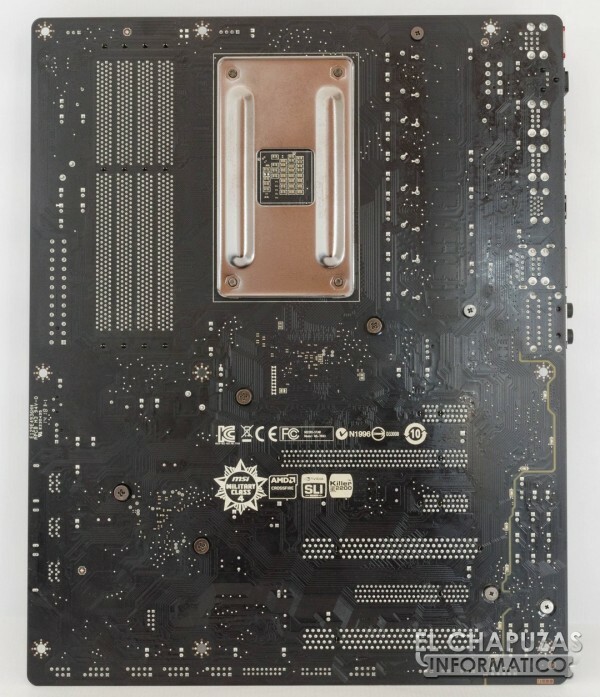 The back side of the motherboard shows a completely black PBC with not much to say about it except for the use of fasteners to fix the VRM dissipater and the chipset. If we take out the dissipaters we can see how they make use of thermal pads for the VMR and solidified thermal paste in both sections of the chipset (north/south bridge). 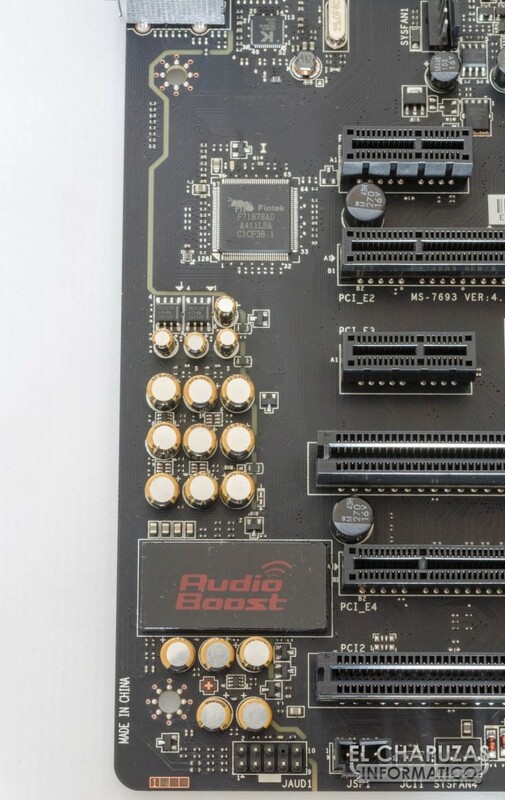 The AM3+ socket is fed by a potent VRM of 32 phases that will be in charge of transforming power taken from the ATX 8 pin connector on the upper margin. MSI’s Military Class 4 certification guarantees that only good quality components have been used, such as high efficiency, durable Hi- C condensers and ferrite super chokes. 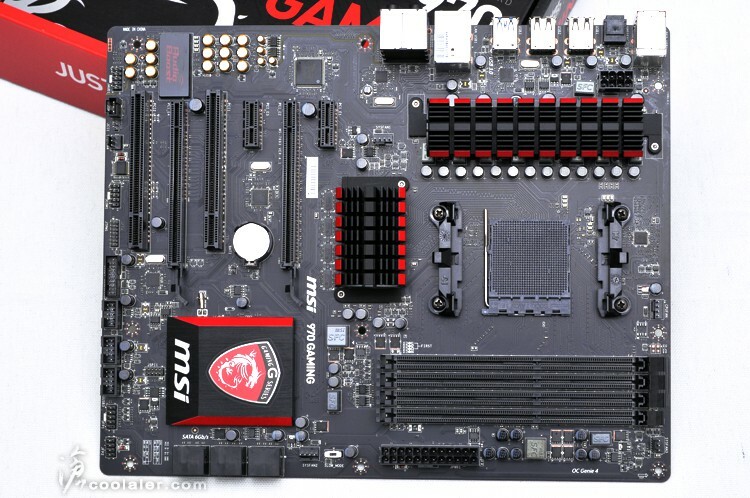 The MSI 970 Gaming motherboard has a BIOS named MSI Click BIOS 4 that offers support for the keyboard, mouse ant for doing screen shots through a pen drive. The Settings tab encompasses the general configuration of the components and the ports of the motherboard, while the control of the processor, the memories and voltages are found on the OC tab. We can also update the BIOS through a comfortable interface, create OC profiles, monitor voltages and temperatures or even monitor what we have connected to the motherboard. Contrary to what happens with Intel processor motherboards, for AMD processors we have only analyzed a handful of models, and all of them for APUs, so we have no choice but to compare the obtained results of this analysis with those of other platforms. We should mention that we have calculated the average of all the analysis done over the values of the i7-4470K. As we can ascertain from the graphs below, the new AMD 970 chipset does not offer any extra performance on pure calculus testing over last generation’s Z87, there are no notable differences between the different models analyzed either. Likewise, we have done a comparison on the performance of Corsair Vengeance Pro 2133 MHz memories against what we can achieve with a Z87/Z97 motherboard and Intel’s Core i7-4770K processor. The results show the difference in performance in this aspect, which has clearly inferior read/write on memory rates. 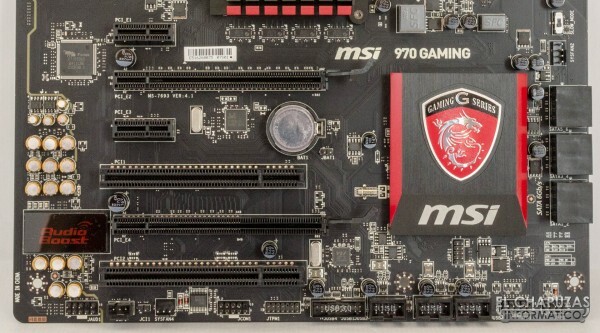 The MSI 970 Gaming board answers to an aesthetic modernization of the 970A-G46 model, although with some extra features to justify the “Gaming” nomenclature. 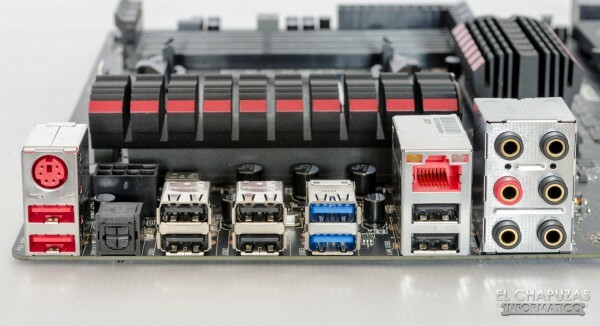 It allows the combination of FX processors to up to 2 graphic cards in CrossFire with excellent connectivity that allows for 6 SATA units and up to 18 USB ports (4 USB 3.0), an integrated midrange to high end sound card with audio improvement and Gigabit Ethernet Killer network for prioritizing game packages. We can find the MSI 970 Gaming selling for around 80 dollars on Amazon, a similar price compared to other models with the AMD 970 chipset. We have to take into account that this price competes against the models that integrate the chipset AMD 990X/990FX with a surely better VRM and higher OC capacity, but with some improvements on networks and radio that make it so interesting.